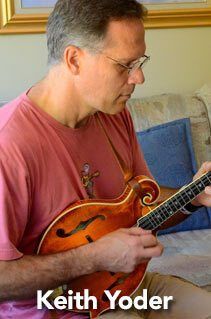 Keith Yoder performs on and teaches guitar, banjo, mandolin, fiddle, resophonic guitar, bass and drums. He has taught at music camps including Steve Kaufman’s Acoustic Kamp, British Columbia Bluegrass Workshop/NimbleFingers, and the Walker Creek Music Camp. He has performed with bluegrass legends from Bobby Hicks to Dan Crary, and has recorded several CDs, the most recent featuring him playing all the instruments and singing all the vocal parts.